Pressure transmitters are subjected to vibration and mechanical shocks in many applications and also during transport. Below, the terms shock and vibration will be explained in greater detail. Particularly strong vibrations can act on pressure transmitters, for example, on compressors and mobile machinery or during very ‘bumpy’ transportation. When the pressure transmitter is exposed to a short-duration, individual heavy loading, one refers to this as a mechanical shock. This occurs, for example, in car accidents or after a drop, when the object meets the ground and decelerates abruptly. The vibrations acting on pressure transmitters are described in the data sheets by their frequency. Moreover, the max. accelerations to which the instrument may be exposed are specified. These are usually given as a multiple of the acceleration due to gravity [g = 9.81 m/s²]. At low frequencies, the vibration is not defined by the acceleration, but rather by the amplitude. 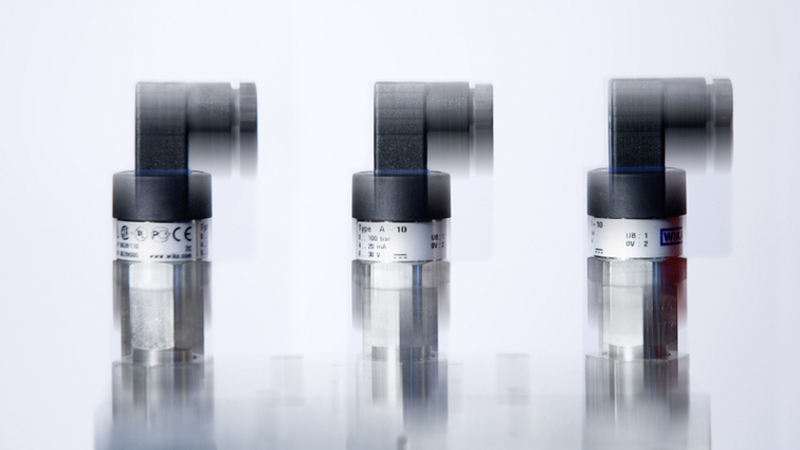 Standard industrial pressure transmitters can withstand vibrations of about 50 to 2000 Hz, with accelerations up to 20 g. Shocks are also defined with a multiple of the acceleration due to gravity. Similarly, the duration of this loading is also specified. For this, standard values are up to several hundred g lasting a few milliseconds. In their data sheets, the leading manufacturers distinguish between vibration and shock resistance; sometimes even between the vibration resistance and the continuous vibration resistance. The foundations for the appropriate tests and undertakings originate, in most cases, from the IEC standards 60068-2-6 (vibration) and 60068-2-27 (shock). For mechanical pressure gauges, the instructions are found in EN 837. So that pressure transmitters can withstand high mechanical loadings, several structural measures are taken. Thus, for example, most of the entire case is welded, the electronics inside it are potted and connectors are designed for these loads. Moreover, only the most resilient materials are used. In particular, very large loads caused by vibration and shock occur in the field of mobile machinery. For this industry, the leading manufacturers offer their own product lines just to meet these requirements. For this segment, WIKA offers an extremely shock and vibration-resistant pressure transmitter with the MH-2.